Antelope Oil Tool, provider of casing running and cementing equipment, and Centergenics, an oilfield technology engineering company, have announced the first generation stop collar for the CentraMax® CT Product Line. 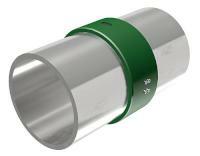 The CentraMax® Quick-Lock Stop Collar© is utilised with Antelope’s On-The-Pipe-Solutions™ CentraMax® CT Centralizers. Robust in performance, with a quick and simple installation method, the stop collar yields high holding forces (>150,000 lbs.). “We were looking to make our On-The-Pipe-Solutions™ centralizers more efficient for our customers, allowing for centralizer installations in our customers’ pipe yards or on location at the rig. With safety and quality in mind, we wanted a team whose company values lined up with ours. Centergenics has a long history of collaborating with in-house engineering teams to develop custom-fit solutions; and with them, we were able to design, develop and test this first generation CentraMax® Stop Collar that is easy and safe to install with high performance features,” says Iain Levie, Antelope’s VP of Deepwater Sales and Technology. The Quick-Lock Stop Collar© can be installed anywhere on the casing, at any stocking location, by sliding the stop device on to the casing with the centralizer and removing the shipping screws once the desired location of the stop is reached. Provided with both Uni- and Bi-directional versions, there are no special setting tools required. The minimalistic design creates ease of installation, and eliminates the casing shipment requirement thereby reducing lead time and cost. “Working with the Antelope team is fun and challenging. We were able to collectively and strategically focus on the product gap in the CentraMax® CT Product Line, and work together to develop a safe, cost effective and streamlined solution to their clients who utilise their on-the-pipe-solutions™ centralizer. This type of partnership is what Centergenics stands for, our commitment to the company’s engineering and leadership team to develop and design fit-for-purpose solutions,” says King Anderson at Centergenics.